Celebrate New Year's Eve like a VIP with an unforgettable New York City dinner and fireworks cruise. Get up-close views and the glittering New York skyline as you glide gracefully along New York Harbor in an elegant mega-yacht. Savor a hearty lobster buffet dinner, and dance the night away to sizzling tunes. You're then treated to a front-row seat for one of the biggest fireworks shows in the US! This New Year's Eve experience is available nowhere else. 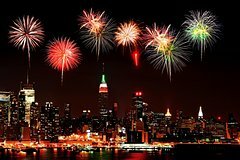 Savor the New Year's Eve excitement as you step aboard the boat at Manhattan's 41st Street Marina in early evening. Take in views of Manhattan's sparkling skyline as you glide along New York Harbor on a 3-hour dinner and fireworks cruise. Pile up your plate with lobster and other items from the seafood-centric buffet. Communal seating lets you mingle with your fellow party goers, making for a more festive experience. As the clock strikes midnight, pause in front of the majestic Statue of Liberty for a celebratory Champagne toast. Then make your way to a prime viewing location for the fireworks show. Find your perfect spot on the indoor or outdoor viewing decks and enjoy captivating views of fireworks bursting over the city skyline during a 30-minute spectacle. After the thunder of fireworks dies down, your onboard DJs keep the party going with the latest hits and quintessential party songs. Dance, drink and soak up the beautiful views as your boat makes its way back to the 41st Street Marina, where your exclusive New Year's Eve cruise come to a close around 1:30am.